Installation: RB Zip-Tiles can be installed over any smooth surface including concrete, asphalt, wood or tile. No special tools are required; you simply hammer the tiles together with a rubber mallet. Transition strips are available. Portability: As no adhesives are used in installation, RB Zip-Tiles can easily be removed and re-installed again and again. 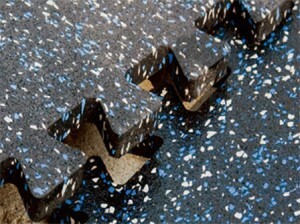 Environmental: RB Zip-Tiles are made from 100% recycled rubber and a specially engineered polymer binder. Because of the high level of recycled material in each tile, these products meet and exceed the requirements set forth in U.S. Executive Order 13101, Greening the Government and can be a contributing factor towards LEED Green Building Council certification. Durable: Custom-formulated, high strength polyurethane binders, similar to those used in synthetic running tracks, are used in the construction of RB Zip-Tiles. 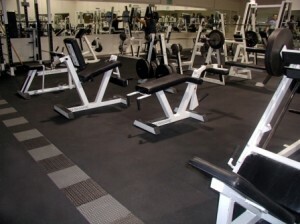 When they are combined with recycled tire crumb, a very durable flooring material is produced. Sound and Shock Absorption: RB Zip-Tiles have excellent sound and shock absorption qualities, and they can also serve as an effective vibration buffer. These characteristics are particularly important for indoor applications. Anti-Fatigue Resilience: Fabricated from thousands of fine rubber granules, RB Zip-Tiles offer superior underfoot comfort. Their resilient properties cushion the strain from running, exercising, walking or standing. Easy to Clean: Cleaning involves a broom, damp sponge mop or vacuum cleaner. If desired, a mild detergent such as CleanBreak can be used to sanitize the flooring. American Made: RB Zip-Tiles are proudly made in the USA. Minimal Odor: RB Rubber’s unique manufacturing process virtually eliminates the strong odor (rotten egg smell) prevalent in many competing products. This is particularly important for indoor applications. ISO 9001: RB Zip-Tiles are manufactured in a facility that is registered to the internationally recognized ISO-9001 Quality Standard. Standard Products: RB Rubber maintains a substantial inventory of 28.5″ X 28.5″ (5.64 sq. ft.) Zip-Tiles in thicknesses including 8 MM and 9.5 MM. In addition to black, our inventory of standard products includes RB Zip-Tiles in Grey, Blue, Red, Green, Blue/Gray, Cocoa/Eggshell, and Yellow (see below). The color concentration of the standard tiles is 17%. Quality/Warranty: RB Zip-Tiles are covered by our industry leading 5 Year Limited Warranty.